I purchased my 1986 pickup with the intention of turning it into a capable rockcrawler. I knew that part of that involved replacing the Independent Front Suspension (IFS) with a solid front axle. 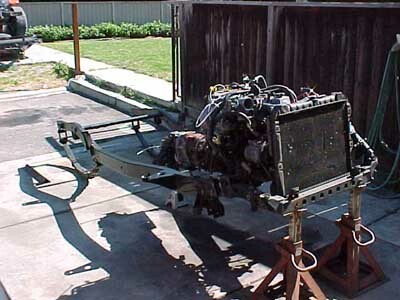 I could have purchased an 1985 or older pickup that comes with a live front axle from the factory, but I was very interested in the 22RTE factory turbocharged motor and the stronger transmission, transfer case, and rear differential that accompany this motor. 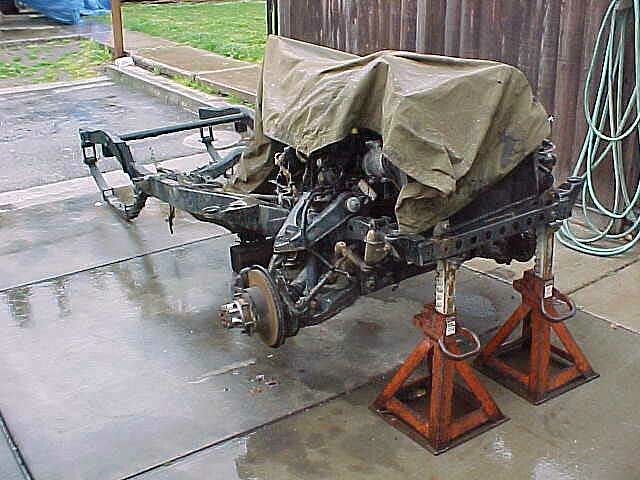 Besides, Solid Axle Swaps (SAS) are common enough these days that I did not let the IFS intimidate me. Parts included in the All-Pro Spring Hanger Kit. Photo courtesy of Chris Geiger. Part of the reason solid axle swaps have become so common is thanks to All-Pro Off-Road. Although there are several different spring hanger kits on the market now, All-Pro was the first to offer such a product on a large scale. The All-Pro hanger kit includes the front spring mount, rear frame tubes, shackles, shackle mounts, and jigs for the shackle mount placement. The kit mimics the factory Toyota arrangement with the solid mount in the front of the springs and the shackle in the rear. The All-Pro hanger provides 1" of lift beyond a factory spring hanger application and also has a provision which allows longer than stock front springs to be used. The 1" drop hanger balances the tradeoffs between the use of flatter (and thus better flexing) springs and limiting approach angle and ground clearance. 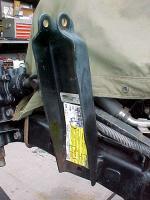 The drop hanger also adds precious clearance between the draglink and pitman arm during compression. It should be noted that it is not necessary to remove the cab of the truck to perform the following modifications! While my standard cab was in the process of being replaced with an Xtra Cab, I decided it would be best to perform the solid axle swap on my truck at the same time when I would have easy access to brackets on the inside of the frame. I started by torching off all of the IFS mounts and grinding them flush with the frame. 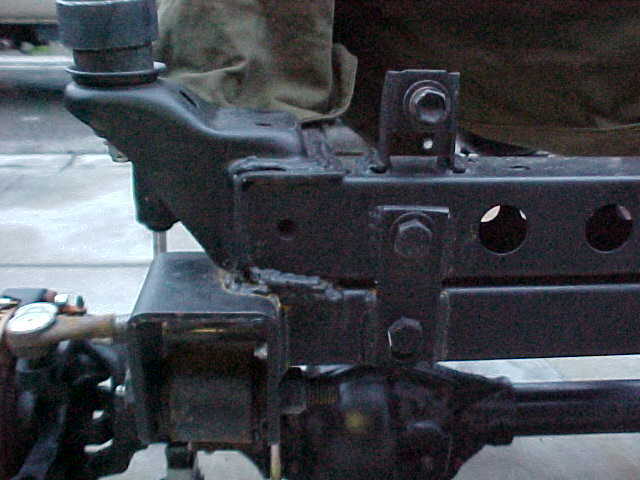 Once the cradle for the front differential is cut off, the entire front suspension can be removed quite easily. You could do this with a reciprocating saw but it would require a lot more time and effort. Next I installed the spring hanger, which was quite simple thanks to the mounting brackets that All-Pro provides. These brackets attach to the spring hanger and the bolts in the front of the frame intended for the bumper and allow easy alignment. I MIG welded around the corners of the spring hanger, as well as in the middle, and ended up welding the bolt-on brackets in place as well for added strength. The spring hanger that I purchased is the original design. All-Pro has since added gussets to the front and sides of the spring hanger to further strengthen the product. 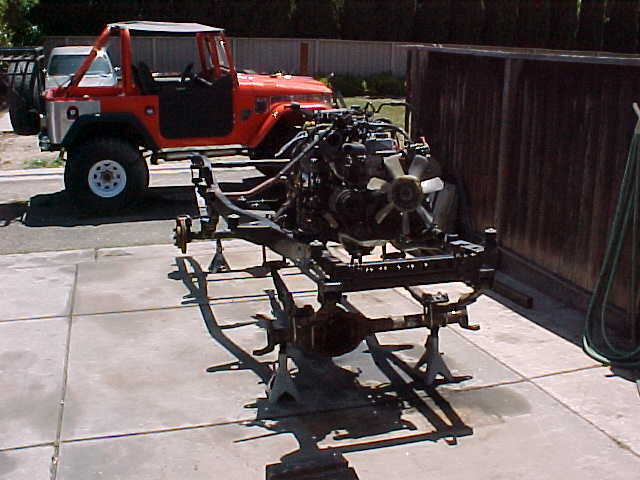 From left to right is the Independent Front Suspension, the front end after the suspension was removed, and test fitting the solid axle. This truck is very much a work in progress. The shackle mounts were more difficult to locate than the spring hanger. 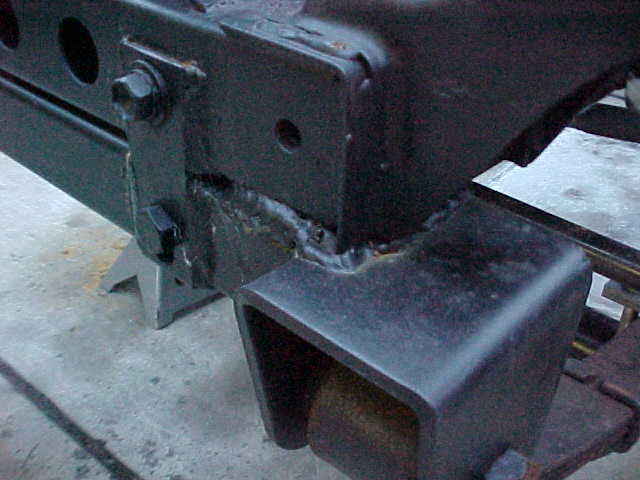 The mounts are to be located under the forward cab mount. 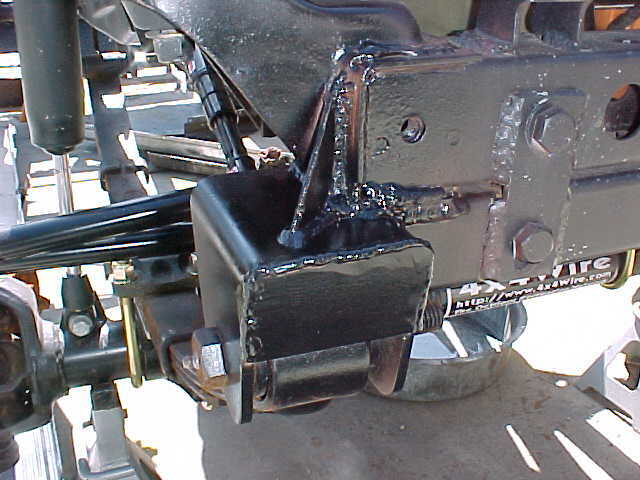 The jigs I received from All-Pro did not fit snugly within the cab mount though and allowed about " of variance. I ended up butting the jigs up against the front of the cab mount and then used a 1 " hole saw to cut through the frame. This was difficult to do as the frame contains structural steel inside the box in this area. My father ended up fashioning a jig out of threaded rod to run between the shackle mounts in order to ensure that the mounts were straight and even. After careful measurements the frame sleeves were MIG welded into place. I purchased All-Pro shackles that come with greasable eye bolts and are 1 " longer than stock. These shackles feature a straight design employing welded spacers to compensate for the different between the frame and spring widths and allow more spring travel without frame interference. Various views of the completed spring hanger and shackle mounts. 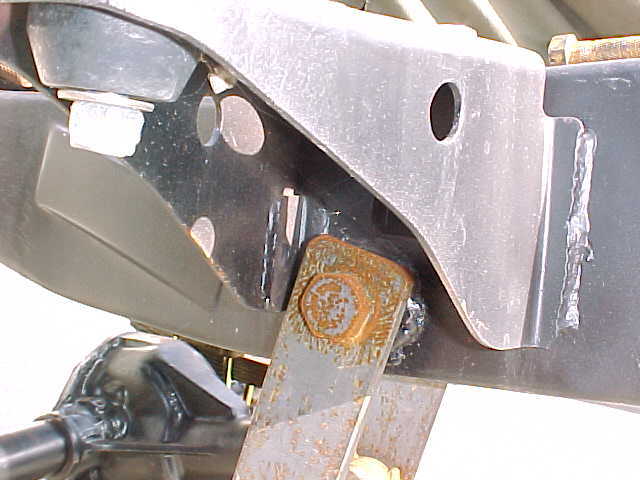 Note that the poor shackle angle is due to a number of factors such as the lack of weight on the truck, the suspension sitting on jack stands, and the brand new springs. As with spring hangers, there is an abundance of different springs available for the front of Toyota trucks. Popular options include Alcan springs, Jeep Wrangler springs, Rancho 44044 (Wagoneer) springs, and using stock rear springs in the front. I chose to use All-Pro 4" lift springs on the front of my truck because they are reasonably priced and designed to work with All-Pro's spring hanger. The All-Pro springs are 1 " longer than stock Toyota springs and also move the axle forward 1 ", which is critical for tire clearance at the firewall. These custom dimensions result in a spring that is not symmetric, so note when mounting the springs that the longer half goes towards the rear and the military wrap is in the front. These springs are comprised of 6 shot-peened leafs with teflon liners and a spring rate of 220 lbs/inch. The shock tower placement on the frame. Here you can see where the shock tower is welded to the frame. The final step of the front suspension was adding shocks and shock towers. 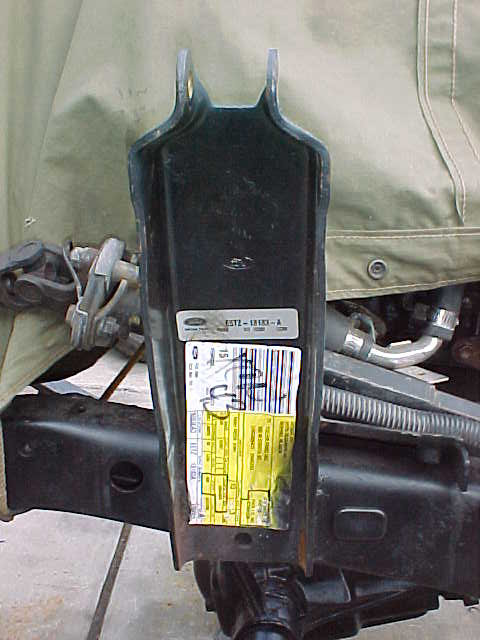 The decision to use factory Ford shock towers (PN E5TZ*18183*A) was based solely on price. These towers are inexpensive and can be positioned to fit long travel shocks. The shocks I decided on were Doetsch Tech Pre-Runners (PN 8403) that offer 13 1/2" of travel. I measured the shocks to offer 6" of compression and 7 1/2" of extension before MIG welding the shock towers to the frame. Summit Racing carries these inexpensive twin tube, cellular gas shocks with valving that should work well on the front of my relatively light pickup. Note that you may have to trim you inner fenders to fit the shock towers depending on how high you mount them, I will likely have to do the same when my cab is replaced. Bumpstops will also be added at that time to limit contact between the draglink and tie rod, as well as the sheetmetal and the tires. Product prices are as follows. The prices listed are suggested retail, I actually bought my springs for $249 and spring hanger kit for $229 when All-Pro was having a sale. If, like me, you have the luxury of planning ahead on your axle swap and can shop around and look for bargains, you should be able to beat most of the prices listed below. All-Pro also offers a complete kit including steering, springs, spring hanger, bushings, shocks, shock towers, shackles, wheel spacers, bumpstops, brake lines, brake rotors, and a steering stabilizer for those who prefer one stop shopping. My application is unique and I was hoping to save money on some parts, requiring me to piece everything together separately. Gussets added to the top and front of the spring hanger. I had my father gusset the front and top of the crossmember to mimic the current All-Pro crossmember and add strength to resist bending. I am confident that this setup can stand up to abuse far greater than I plan on administering.